An Assistant Teacher provides assistance to the Classroom teachers and performs various other duties. The roles and responsibilities of an Assistant Teacher are to instruct the students, supervise the students, perform other assigned clerical tasks and take charge of extracurricular activities of the School. The typical duties of these teacher assistants are to reinforce the presented lessons with the students, enforce class and school rules, assist the class teachers in record making, tracking attendance, calculating grades and preparing report sheets; help the teachers in making study materials, keep the lab equipped and ready for use, assist and supervise the students in work assignments, field work or projects. 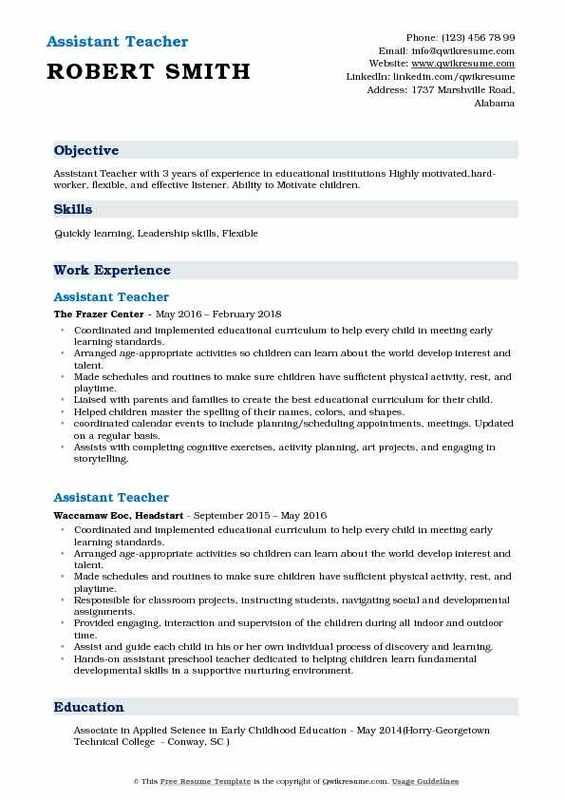 An Assistant teacher should have experience working with students and have a flair for teaching basically. These teacher assistants should have excellent numerical ability and possess basic computer knowledge. Assistant Teachers can come from any educational background, though some of the Assistant Teacher Resume showcase a degree with a specialization in education. 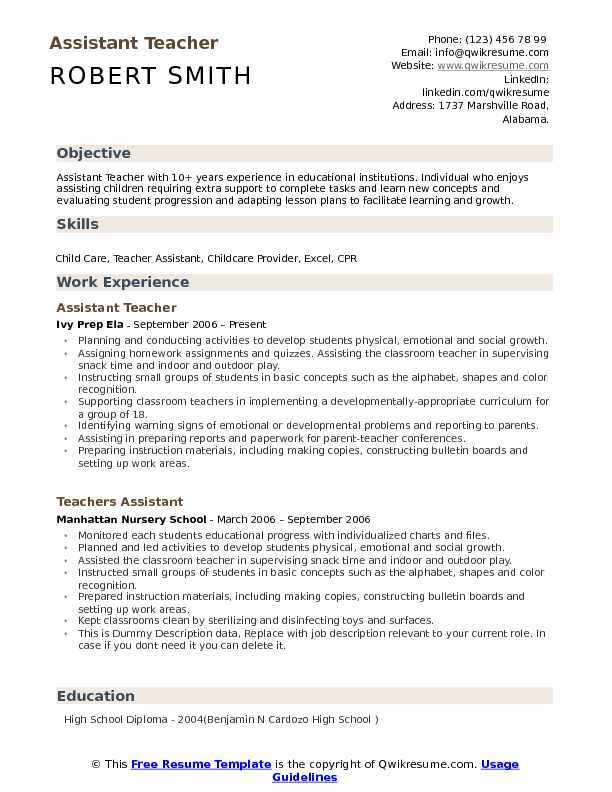 Summary : Assistant Teacher with 10+ years experience in educational institutions. Individual who enjoys assisting children requiring extra support to complete tasks and learn new concepts and evaluating student progression and adapting lesson plans to facilitate learning and growth. Planning and conducting activities to develop students physical, emotional and social growth. Assigning homework assignments and quizzes. Assisting the classroom teacher in supervising snack time and indoor and outdoor play. Instructing small groups of students in basic concepts such as the alphabet, shapes and color recognition. Supporting classroom teachers in implementing a developmentally-appropriate curriculum for a group of 18. Identifying warning signs of emotional or developmental problems and reporting to parents. Assisting in preparing reports and paperwork for parent-teacher conferences. Preparing instruction materials, including making copies, constructing bulletin boards and setting up work areas. Keeping classrooms clean by sterilizing and disinfecting toys and surfaces. 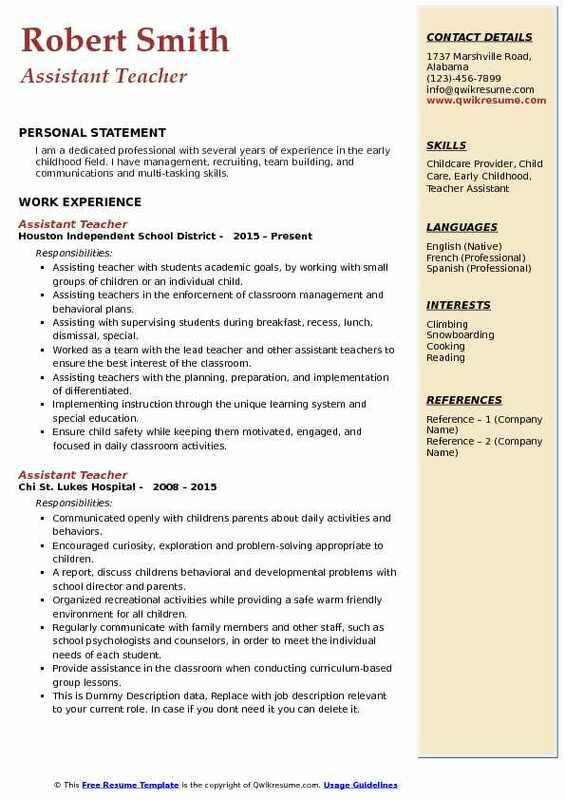 Headline : Assistant Teacher who is organized and self-motivated with 5 years of experience in an early childhood center. Enthusiastic and creative with the ability to support and meet children's needs. Identifying and providing solutions for any problem areas within classrooms. Working with children to provide a safe and nurturing environment for social and academic growth. Maintaining the health and well-being of the children under their supervision. Assisting lead teachers in developing daycare curriculums for groups of students. Providing assistance in designing and imparting lessons catering to each student's individual abilities. Ascertaining that classroom environment is in accordance to program goals and philosophies. Performing research activities to develop educational materials to aid classroom instruction. Handling cleaning and maintenance activities of the classroom and ensure that any hazardous materials are discarded before children arrive. Performing data entry and maintenance, which requires entering personal information, as well as, private work records. 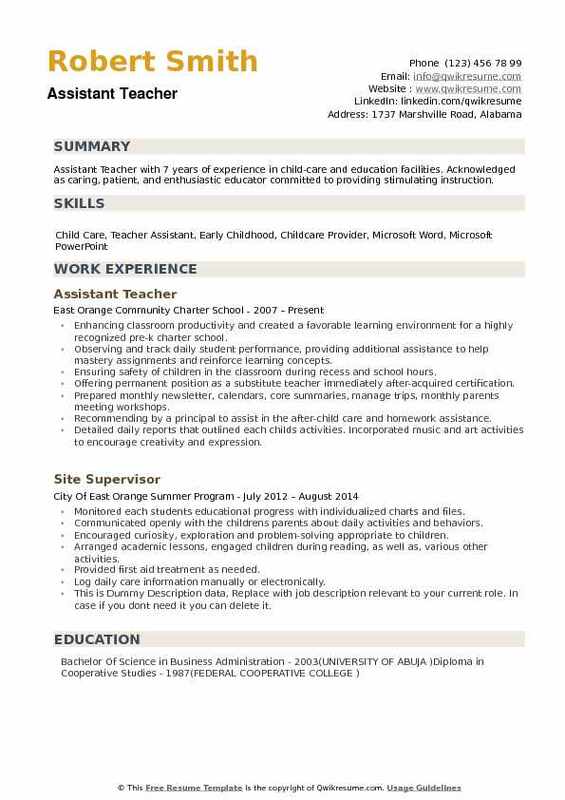 Headline : Passionate educator working as a Teacher Assistant with 6 years of experience in educational institutions who works well with children. Organized, focused multi-tasker able to communicate effectively and thrive in stressful situations. 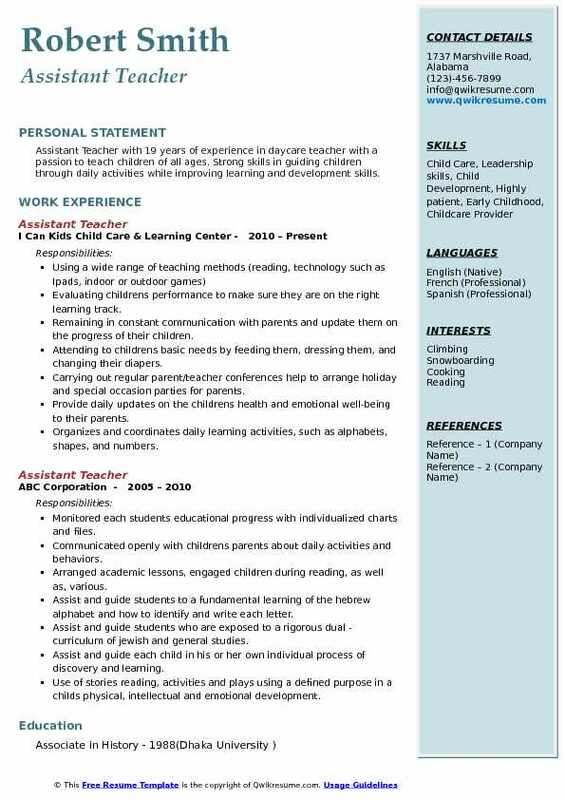 Was an Assistant in a preschool classroom with children 3 to 4 years of age. Worked side by side with the head teacher and another assistant teacher to provide the children with a fun, safe and secure environment in which they could grow and explore freely. Assisted the head teacher with planning and collaborating on ideas for weekly lesson plans. Worked with the children in both large group and small group activities by providing hands-on learning experiences while encouraging and expanding on their interests. Greeted children and their parents as they arrived and communicated with parents on a daily basis. Wrote weekly observations, progress reports two times a year for children and conducted parent-teacher conferences. Attended/participated in all staff professional development days, online educational and center required training. Summary : Assistant Teacher with 15 years experience in educational institutions.Talented early education professional with diverse experience in planning and implementing various activities for promoting the physical, social, emotional and intellectual growth of children. Assisting the teacher in all aspects of the management of the classroom on a day to day basis. Responsible for teaching, reading, spelling and writing to groups of first-grade students. Attending mandatory enrichment training to assist in providing a safe learning environment. Supervising and assisting children during all transitions between classes and with arrival and dismissal from school for the day. Reassuring and encouraging students to display appropriate behavior both in and out of the classroom. Interacting with families and providing them with necessary updates or concerns with their child. Organized recreational activities while providing a safe warm friendly environment for all children. Providing a learning environment that is flexible and changes per the needs and interests of the children. 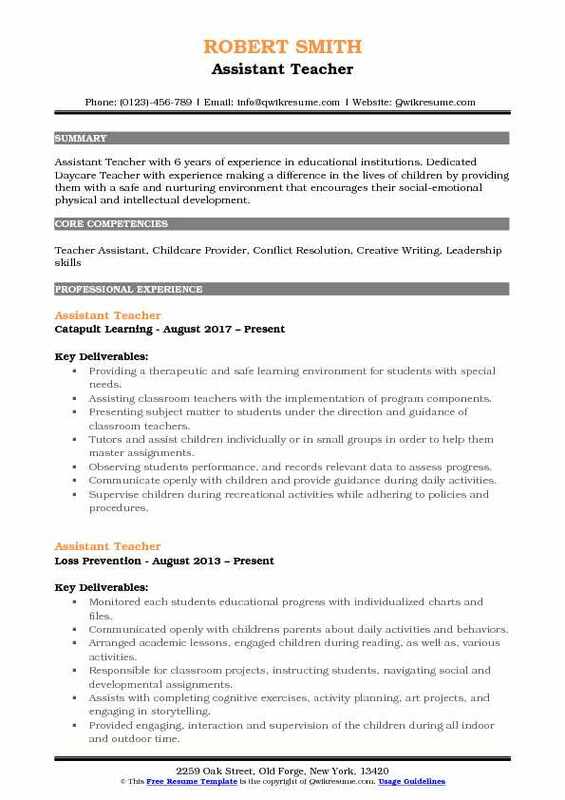 Summary : Assistant Teacher with 19 years of experience in daycare teacher with a passion to teach children of all ages. Strong skills in guiding children through daily activities while improving learning and development skills. Evaluating children's performance to make sure they are on the right learning track. Remaining in constant communication with parents and update them on the progress of their children. Attending to children's basic needs by feeding them, dressing them, and changing their diapers. Carrying out regular parent/teacher conferences help to arrange holiday and special occasion parties for parents. Provide daily updates on the children's health and emotional well-being to their parents. Organizes and coordinates daily learning activities, such as alphabets, shapes, and numbers. 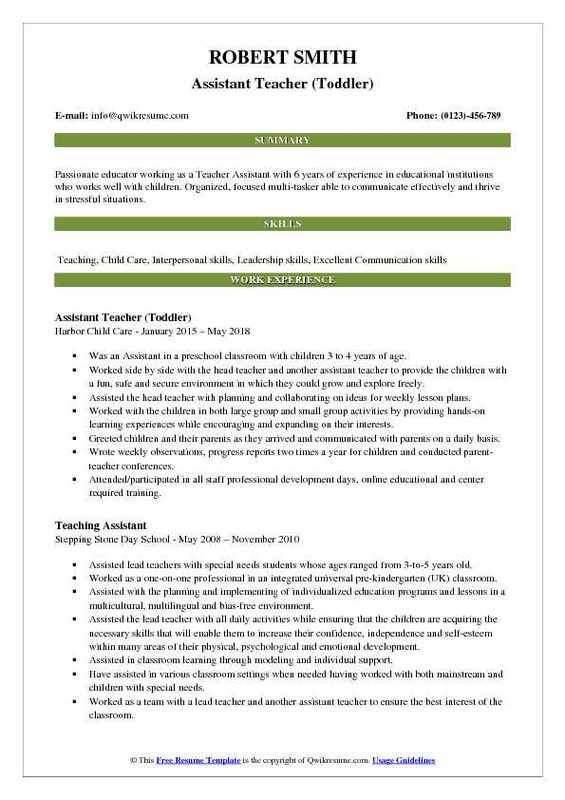 Objective : Assistant Teacher with 3 years of experience in educational institutions Highly motivated,hard-worker, flexible, and effective listener. Ability to Motivate children. Coordinated and implemented educational curriculum to help every child in meeting early learning standards. Arranged age-appropriate activities so children can learn about the world develop interest and talent. Made schedules and routines to make sure children have sufficient physical activity, rest, and playtime. Liaised with parents and families to create the best educational curriculum for their child. Helped children master the spelling of their names, colors, and shapes. coordinated calendar events to include planning/scheduling appointments, meetings. Updated on a regular basis. Assists with completing cognitive exercises, activity planning, art projects, and engaging in storytelling. Headline : Dedicated Daycare Assistant Teacher with experience as making a difference in the lives of children by providing them with a safe and nurturing environment that encourages their social-emotional physical and intellectual development. Frequent communication with both parents and children. Provided continual care to infants to monitor their well-being and ensure their needs were met. Helped organize activities for the infants to help develop visual, auditory, and early motor skills. Provides a learning environment that reflects a relaxed atmosphere for the children to learn. Planning and providing experiences for children that promote critical thinking and inquiry. Preparing meals, completing feedings, hygiene restoration, and giving personal attentiveness when needed. Headline : Assistant Teacher with 6 years of experience in educational institutions. 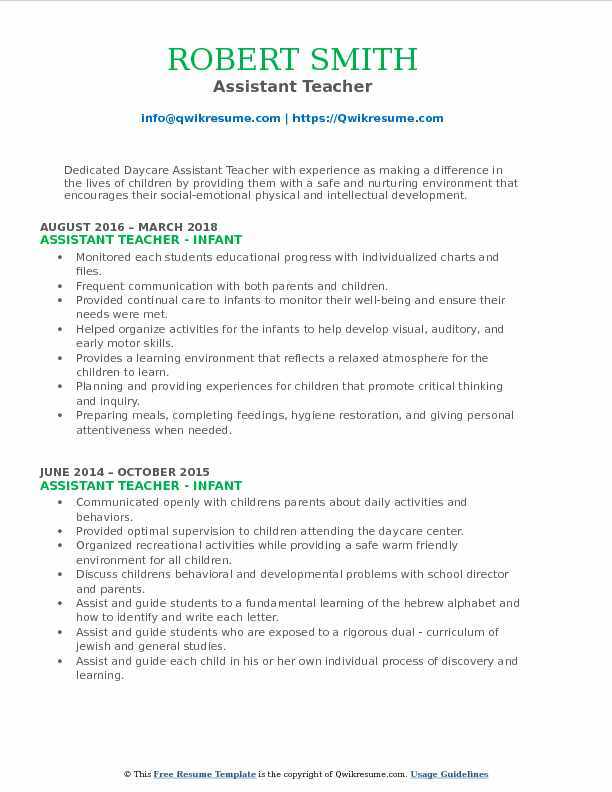 Dedicated Daycare Teacher with experience making a difference in the lives of children by providing them with a safe and nurturing environment that encourages their social-emotional physical and intellectual development. Providing a therapeutic and safe learning environment for students with special needs. Assisting classroom teachers with the implementation of program components. Presenting subject matter to students under the direction and guidance of classroom teachers. Tutors and assist children individually or in small groups in order to help them master assignments. Observing students performance, and records relevant data to assess progress. Communicate openly with children and provide guidance during daily activities. Supervise children during recreational activities while adhering to policies and procedures. Supervising students in the class, enforcing proper school and class rules and providing teacher relief. 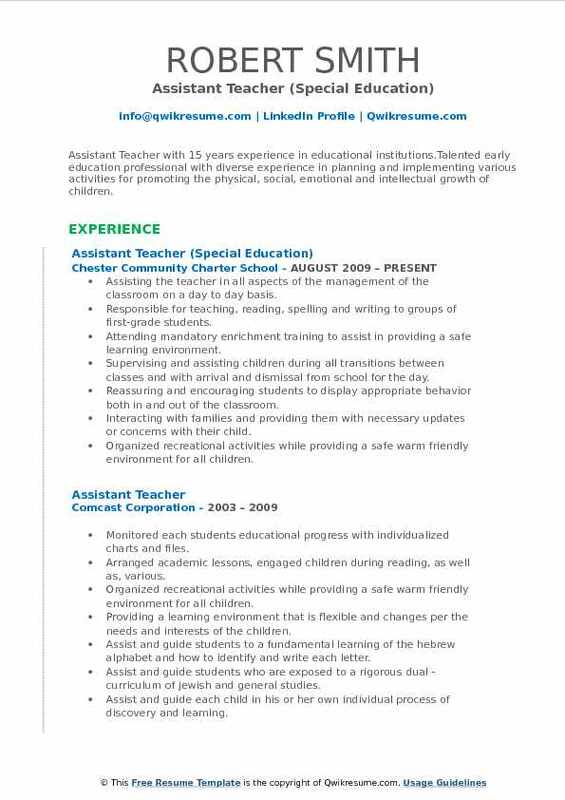 Summary : I am a dedicated professional with several years of experience in the early childhood field. I have management, recruiting, team building, and communications and multi-tasking skills. Assisting teacher with students academic goals, by working with small groups of children or an individual child. Assisting teachers in the enforcement of classroom management and behavioral plans. Assisting with supervising students during breakfast, recess, lunch, dismissal, special. Worked as a team with the lead teacher and other assistant teachers to ensure the best interest of the classroom. Assisting teachers with the planning, preparation, and implementation of differentiated. Implementing instruction through the unique learning system and special education. Ensure child safety while keeping them motivated, engaged, and focused in daily classroom activities. 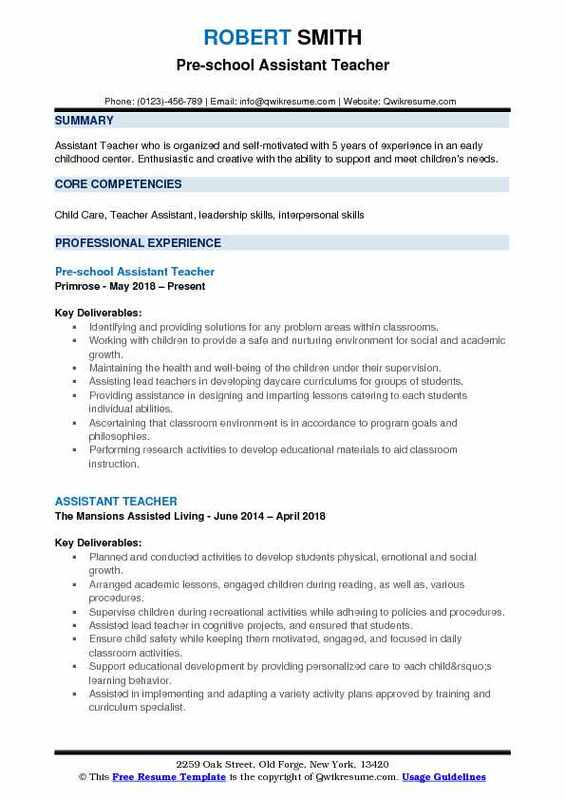 Summary : Assistant Teacher with 7 years of experience in child-care and education facilities. Acknowledged as caring, patient, and enthusiastic educator committed to providing stimulating instruction. Enhancing classroom productivity and created a favorable learning environment for a highly recognized pre-k charter school. Observing and track daily student performance, providing additional assistance to help mastery assignments and reinforce learning concepts. Ensuring safety of children in the classroom during recess and school hours. Offering permanent position as a substitute teacher immediately after-acquired certification. Prepared monthly newsletter, calendars, core summaries, manage trips, monthly parents meeting workshops. Recommending by a principal to assist in the after-child care and homework assistance. Detailed daily reports that outlined each child's activities. Incorporated music and art activities to encourage creativity and expression.